Have you ever made a dish or a recipe for the first time and upon the very first bite, immediately wondered why you haven’t been making it for years? That’s what happened when I made socca for the first time! I had seen recipes here and there online and always thought in the back of my mind “I really need to make that”. I finally did yesterday for lunch and it is official, on the first bite – I was OBSESSED. 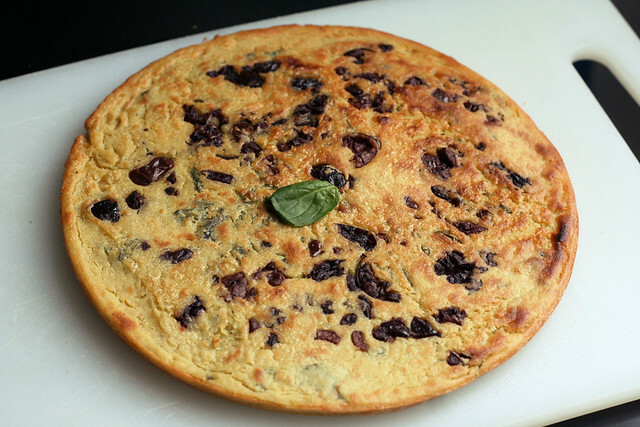 Socca, also known as farinata or cecina, is a sort of thin, unleavened pancake or crêpe of chickpea flour. Served hot and crispy, this chickpea pancake is a quintessential street food found in Nice, France. Many times it is browned or even blackened around the edges, and it has an almost custard like, tender inside. From what I have read, traditionally it is made in a cast iron pan over hot coals or a fire, but it can certainly be made at home in a hot oven, either in a cast iron pan, cake pans or a pizza pan. Most recipes I came across called for only about a cup of chickpea flour to make 1 big socca in a larger cast iron skillet or two smaller (about 7-inches each). Since I only have a smaller cast iron skillet and I was afraid I would ruin this on my first try, I decided to increase the ingredients to make it work in two 9-inch cake pans. Plus, I wanted to have two soccas and I also wanted them to be a bit thicker to hold up to the roasted veggies. It worked perfectly. If you have smaller cake pans or want to make one large one, or you want two and you want them a bit thinner, just go with 1 cup of chickpea flour and about 1 1/4 cups of water and maybe just 2 to 3 tablespoons of olive oil. 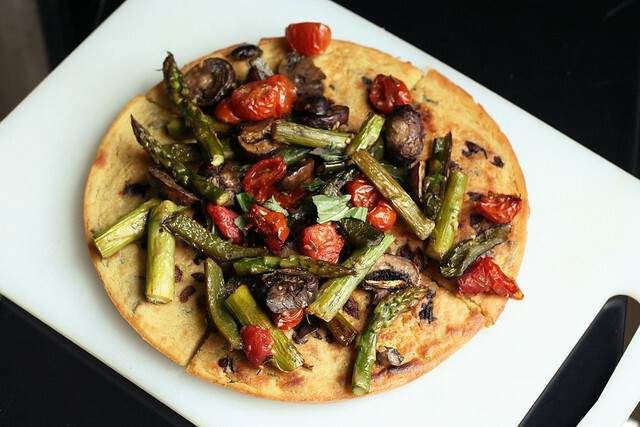 Besides looking incredibly delicious, what really intrigued me about all of the socca recipes I found, were that almost all of them were naturally gluten-free, since the only flour used is chickpea (or garbanzo bean) flour. I happened to have Bob’s Red Mill’s blend of Garbanzo and Fava Bean flours on hand, so I decided to go with that. It worked perfectly, but obviously if you have traditional chickpea (or garbanzo bean) flour that will work, as well. I plan to make this again and again, now that I know how easy it is to make, so there will be plenty of times to use just chickpea flour. 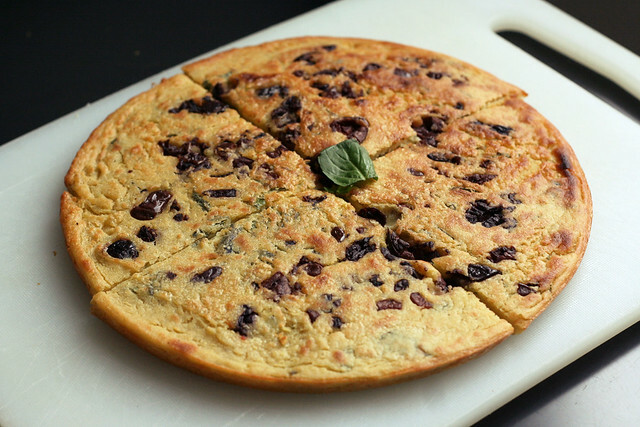 The nice thing about socca is you can simply pop it out of the pan, cut it into wedges and eat it as is or you can play with different toppings and/or ingredients to include in the batter. Cut up into bite-sized pieces it is a great appetizer or snack for a handful of people, or you can top it with lots of fun ingredients and serve it flatbread or pizza style for a meal, kinda like this. I bet you could even opt for sweet ingredients like a little coconut sugar, some cinnamon and a little vanilla and make it a tasty dessert treat or brunch side. So versatile. I am sure traditionalists prefer to not add things like fresh herbs and olives, but I just couldn’t help myself. This batter comes together very quickly, but you should allow it to rest a few hours before using, at the minimum 30-minutes. You can even make the batter ahead of time and cover it and put it in the refrigerator overnight. Socca is meant to be thin and rustic, so don’t stress if yours breaks apart as you flip it out or try to cut it up, just eat it with your hands and enjoy every bit of it. My adorable little lurker, Seri, trying to sneak a sniff of the warm socca! I just roasted a bunch of fresh asparagus, 1 cup of sliced mushrooms, 1 poblano pepper, 1 garlic clove and 1 cup of halved cherry tomatoes with about 1 tablespoon of olive oil and a sprinkle of Herbes de Provence and a little sea salt, in a 425º oven for about 20-25 minutes, until tender and lightly browned. Feel free to top your socca with whatever toppings of your choice or just serve it as is. In a large bowl, sift in the chickpea flour, then add in the salt, and pepper. Whisk in water and olive oil. Then stir in the basil. The batter should be very thin, much like a crepe batter. Let sit on the counter, covered, for as many hours as possible, but at least 30 minutes. You can also cover and refrigerate it overnight. Place two nine-inch round cake pans in the center of the oven and preheat to 500º F. Remove the pans when the oven is to temperature, add a glug of olive oil to each pan (maybe around 1/2 to 1 tablespoon in each pan) swirl around in the pan to get a nice even coating all the way around and up the sides a bit. Return to pans the oven for a couple of minutes to heat up the oil. Once the oil is heated up, carefully remove the hot pans from the oven and pour half of the batter into each pan, split the chopped up olives in half and add half to each pan, just sprinkle over top of the batter. Bake for about 5 to 8 minutes or until the pancake is firm and the edges are set. Then place the pans into the broiler (or turn on the broiler in your oven) and broil for an additional 3-5 minutes, until the top gets some nice browned/black spots. Remove from oven and carefully flip out onto a cutting board. Cut into wedges and top with toppings of your choice. This is great as a meal or as an appetizer. If your pancake is a little thinner and it’s breaking apart, no worries at all, this snack is meant to be rustic and eaten with your fingers. Same here, I am always intrigued but have never tried it, now I have to! You simply must try it, Simone. It’s so amazing and so simple. Thanks for the mention on your blog too. Much appreciated! Beautiful! I’ll have to try this recipe…love that you make them in cake pans too. You always have such great recipes! I can’t wait to make this with fresh asparagus and the first morel mushrooms. Yum! Thanks Amy. You’ll have to let me know what you think when you do. I’ve been seeing this recipe around a lot too and have wanted to try t, you inspired me! Made it tonight ….put rosemary in the batter and topped with mushrooms, roasted red peppers and leeks . Sooooo good, thanks for posting!! You’re right it’s something that will now be a staple. Yeh I have seen so many different variations, with different topping and herbs, etc. that I finally just went for it. Man, I wish I had done so sooner, SO GOOD! Glad you liked it too, April. Thank you for the recipe! That was delicious. Kids ate it too. You are so welcome Johanna. So glad to hear even the kids liked it. SCORE! I am having a SERIOUS Homer Simpson moment here! I am drooling on the keyboard. This looks like some serious food for classy assed vegans right here and I will be cooking this recipe this week. Cheers for an amazing recipe and for the photo’s to back it up. Hahaha don’t short circuit your keyboard with drool, Narf! By the way, this has to be one of the best comments on my blog, EVER – “This looks like some serious food for classy assed vegans right here” So hysterical! And yeh, Seri is by my side the entire time, every time that I cook. She knows better than to take anything, but she sure eyes it all up, with great intensity! Thanks so much for sharing on Allergy-Free Wednesday. Hope you’ll join us again this week with another great recipe! Could you tell me how to pronounce “socca”? It sure looks pretty good… the hardest part will be deciding what toppings to use the first time! Looking forward to trying it this week! 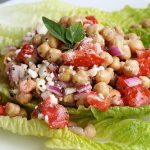 Can I make it with just chickpeas mashed? I like to soak my beans to get rid of all the phytic acids and gas making critters, and I don’t know if chickpea flour is made with pre soaked beans or not. So, I’d like to make my own. Is it possible to just use the beans? Ya know Barb, I am not sure, I have never tried that before. If you do, let me know. Do you have to use chick pea flour? I tried to find some at my grocery store yesterday, but the closest bean flour I could find was black bean? Would regular flour work too? I am so excited to make this!! 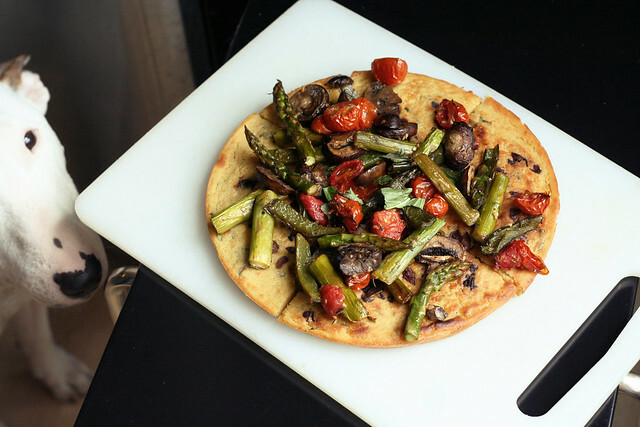 Chickpea flour is definitely what gives the socca it’s texture and flavor. It would definitely not be the same with regular flour. I have used chickpea / fava bean flour but never a bean flour alone that wasn’t chickpea. All I can say is try it with the black bean and see what happens. I am happy to report that this tasted so so so good with the black bean flour. I omited the olives and the herbs, and I roasted mushrooms, asparagus, and broccoli. My daughter absolutely loved it and she does not like beans! I will be making this frequently! I just made this for lunch. I added fresh dill, along with basil, from my garden. After cooking, I topped this socca with caramelized onion, and goat cheese. I heard about Socca for the first time via this recipe — AMAZING stuff 🙂 Made it so many times now and it’s quickly become a favorite around here. 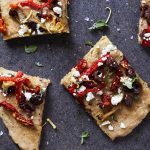 Love it with caramelized onions on top, roasted veggies, or as a makeshift pizza base. I have never even heard of socca, but it sure does look good! 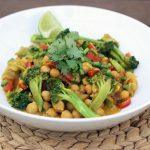 I will have to go get some chickpea flour and try this! 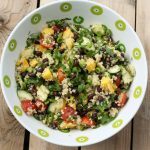 I love recipes that are easy to adapt based on what you want to do with them, and this seems like a great one. If I want to use it as a pizza crust, do you think I should fully bake it before putting on the toppings? Add the toppings before broiling? The first time I made this it was awesome. The last several times they stick to the pan and come out in mushy pieces. Any advice? Do they need to cool in the pan first? I can’t remember what I did differently the first time.